Polymer composites are materials in which the matrix polymer is reinforced with organic/inorganic fillers of a definite size and shape, leading to enhanced performance of the resultant composite. These materials find a wide number of applications in such diverse fields as geotextiles, building, electronics, medical, packaging, and automobiles. This first systematic reference on the topic emphasizes the characteristics and dimension of this reinforcement. The authors are leading researchers in the field from academia, government, industry, as well as private research institutions across the globe, and adopt a practical approach here, covering such aspects as the preparation, characterization, properties and theory of polymer composites. The book begins by discussing the state of the art, new challenges, and opportunities of various polymer composite systems. Interfacial characterization of the composites is discussed in detail, as is the macro- and micromechanics of the composites. Structure-property relationships in various composite systems are explained with the help of theoretical models, while processing techniques for various macro- to nanocomposite systems and the influence of processing parameters on the properties of the composite are reviewed in detail. The characterization of microstructure, elastic, viscoelastic, static and dynamic mechanical, thermal, tribological, rheological, optical, electrical and barrier properties are highlighted, as well as their myriad applications. Divided into three volumes: Vol. 1. Macro- and Microcomposites; Vol. 2. Nanocomposites; and Vol. 3. Biocomposites. Sabu Thomas is a Professor of Polymer Science and Engineering at Mahatma Gandhi University (India). He is a Fellow of the Royal Society of Chemistry and a Fellow of the New York Academy of Sciences. Thomas has published over 300 papers in peer reviewed journals on his polymer composite, membrane separation, polymer blend and alloy, and polymer recycling research and has edited three books. Kuruvilla Joseph is a Reader at St. Berchmans' College (India). He has held a number of visiting research fellowships and has published ca. 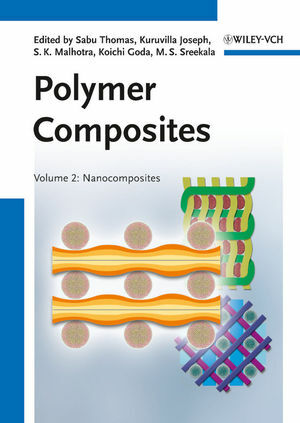 50 papers on polymer composites and blends. S. K. Malhotra is Chief Design Engineer and Head of the Composites Technology Centre at the Indian Institute of Technology, Madras. He has published over 100 journal and proceedings papers on polymer and alumina-zirconia composites. Koichi Goda is a Professor of Mechanical Engineering at Yamaguchi University. His major scientific fields of interest are reliability and engineering analysis of composite materials and development and evaluation of environmentally friendly and other advanced composite materials. M. S. Sreekala is a Senior Research Associate in the Department of Polymer Science and Rubber Technology at Cochin University of Science and Technology (India). She has published over 30 papers on polymer composites (including biodegradable and green composites) in peer reviewed journals and has held a number of Research Fellowships, including those from the Humboldt Foundation and Japan Society for Promotion of Science.